Article 21: New Zealand Butterfly High Value Definitives These high value definitives are very beautiful. Article 73: New Zealand Mt Cook $20 High Value Here is a wonderful high value definitive. I show a large image of this stamp, as well as three details to show the gold inlay and the high quality of the etching. Article 118: New Zealand Nature Definitives These definitives are characterized by clean and colorful designs. The main page contains the low values, and I also show a page with the middle and high values. 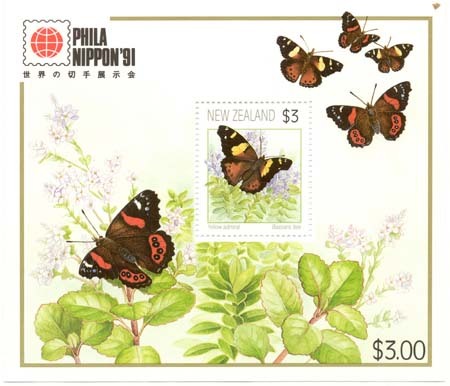 Article 150: New Zealand Butterflies These are beautiful definitives. I show the four stamps, and a sheetlet of the $3 value from the Phila Nippon 1991 Stamp Exhibition.